This is the first article in a series that places the Justice for Our Stolen Children camp in Regina into historical contexts of tipi camps and settler responses to Indigenous presence on the prairies. You can check out the second article on October 5th and the third on October 12th. In the wake of the acquittals of Gerald Stanley and Raymond Cormier in the winter of 2018, there was a growing settlement of Indigenous protesters on the grounds of the Saskatchewan legislature, with the movement expanding to Saskatoon as well. These were not isolated actions, but part of connected and similar efforts such as the expansive water protection encampments at Standing Rock and the Parliament Hill tipis set up on July 1, 2017 to emphasize Canada’s legacy of colonialism, which were removed forcibly ahead of Canada 150 celebrations. The Justice for Our Stolen Children camp on the Saskatchewan legislature grounds has drawn to a close as we finish writing this piece. But this individual camp is also part of a long history of settler responses to tipi camps on the prairies. The members of the 2018 tipi encampments seek concrete action from governments to address the ongoing legacies of colonialism in the legal, foster care, and educational systems. Facing opposition, arrests, and even threats of violence from governments, police, and members of the public, the protesters’ story resembles the stories of Indigenous encounters with colonialism since the first permanent settlers arrived in this region. But parallel to this history of opposition to Indigenous presence is another set of stories. For several decades, and as recently as Canada Day of 2017, Indigenous people have, ironically, also been asked and invited to bring tipi encampments to display at local public celebrations in Saskatchewan. In this series, we want to explore the irony that some tipi villages are vehemently opposed by settlers, yet simultaneously solicited and celebrated in other contexts. These seemingly opposing histories of settler colonialism have both worked to shape settler assumptions and expectations about Indigenous presence. The Saskatchewan camp, which organizers named Justice for our Stolen Children, was first established in February of 2018. Throughout the winter, when the legislature grounds saw little public use, responses from all levels of government held less urgency than they did as summer approached. 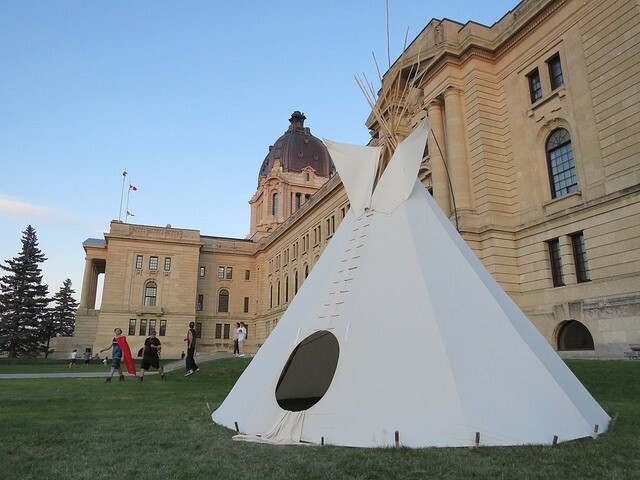 Regina police issued several warnings to the camp that overnighting on the legislature grounds was illegal, but it was not until mid-June that police officers tore down the tipis and dismantled the camp. Within days, the camp reassembled, bigger than ever. Organizers of Canada Day festivities typically held on that site grew anxious — the tipis stood on the place where the beer garden was planned to be. From the provincial government, too, came hardline responses to the camp. Premier Scott Moe argued that members of the camp should vacate the grounds to make space for Canada Day events, once Moe had agreed to a face-to-face meeting with them on July 2nd. Justice Minister Don Morgan felt that protesters were “simply there for their own agendas,” not to represent all First Nations people. In contrast to official responses to the tipi encampment on the legislature grounds, Indigenous presence in the form of tipi camps has also, at times, been invited. One noteworthy example is that of Pion-Era, a celebration of Saskatchewan’s settler history that captivated the city of Saskatoon yearly throughout the 1950s-1960s. Members from what is today called the Whitecap Dakota First Nation were asked to set up a tipi camp at the event grounds, as a showcase and spectacle. But as with the legislature camp of 2018, Indigenous and settler understandings of these camps were very different from each other. By exploring these parallel yet diverging historical moments in this series, we emphasize the need to consider Indigenous perspectives to understand the persistent nature of colonialism, even in moments when inclusivity seems apparent and well-intentioned. In Saskatchewan and across Canada, it is nothing new that formal policy and informal action regarding Indigenous peoples has been based on assumptions of homogeneity. Nor are these assumptions particular to a single political party or value system. The two threads of settler colonialism that we discuss in this series are not partisan political arguments, but rather an opportunity to complicate what has been depicted as a binary, polarized issue. Over the next two weeks, we will expand on how looking at the history of tipi camps in Saskatchewan shows us how Indigenous presence (as exemplified by setting up tipis in public spaces) has been admonished yet at other times solicited by settlers in power. It seems to me there are many good reasons why indigenous people might protest. The group in question was peaceful. I think a meeting with Premier Moe, who is supposed to represent all residents, would have done much to ease any concerns.